Also: Apex Legends, Outward, the making of Everquest and more! There's magic in the air in Warhammer: Vermintide 2, but it's unfortunately accompanied by the musky smell of an army of beastmen. Winds of Magic is the co-op misadventure's upcoming endgame expansion and this month's cover star. We sent Phil to visit developer Fatshark to learn how to be a rancher. Or may just to kill some beastmen. Read our exclusive preview to find out! Everquest is 20 years old, and impressively it's still kicking and even continues to receive updates. Steven grilled the venerable MMO's developers, digging through its origins and the massive impact it had on the fledgling genre. And if you want to keep finding out how the sausage is made, Xalavier Nelson Jr. spoke with Battlefield 5's developers about the creation of its campaign. Elsewhere, we take a trip back to Final Fantasy 14, exploring the new expansion; Dota Auto Chess gets put in the spotlight; we help you improve your shooting skills, or at least your FPS aiming skills; and Rick continues his Dishonored 2 diary. 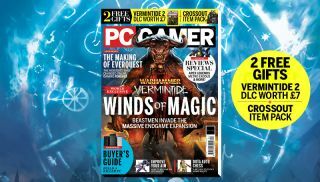 Previews this month include Warhammer: Vermintide 2 - Winds of Magic, Final Fantasy 14: Shadowbringers, Outward, Heaven's Vault and more. And we've got loads of reviews for you, including Apex Legends, Metro Exodus, Far Cry: New Dawn and Slay the Spire. This month's free gifts are Vermintide 2 DLC and a Crossout item pack. Our exclusive Winds of Magic preview. Learn all about the best new Dota mod. Winds of Magic, Shadowbringers, Outward and more previewed. Apex Legends, Metro Exodus, Far Cry: New Dawn and more reviewed. Our case fans group test.